To ask other readers questions about Near-Death Experiences . . . and Others, please sign up. Near-Death Experiences . 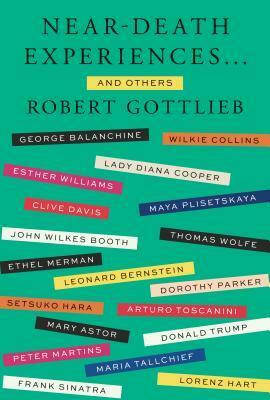 . . and Others by Robert Gottlieb is a collection of articles from features he's written mostly for The New York Review of Books. It is an interesting collection that keeps your attention. It is well written. The articles were all very interesting and made me wish I had at least some prior knowledge of all the classic people Gottlieb wrote about. The book was well organized into categories of relevance and the style of writing was professional yet also conversational which made the essays fun to read, especially the ones that are critiques on various ballets. Thanks for the Goodreads giveaway! I thought this would be a book about near death experiences and stories from people who've experienced them. It wasn't that at all. This was a collection of writings from Robert Gottlieb, and the cover could have done a much better job of stating this. Enjoyed all the mini stories brought back memories of those people featured in the book. This is a very good read. It is a book of reviews the author has written of books and he also gives some info on the author. It was a very enjoyable read I highly recommend. I won a copy of this essay collection via Goodreads Giveaway. I haven’t finished it. I think I can offer a review despite that admission. This is not the book I thought it was. And I don’t find it a book to sit down and read cover to cover. The essays are fascinating and so.well.written. Mr. Gottlieb’s mastery of the English language and the written word are immediately obvious. I think this collection is best digested in small pieces because each essay has such depth and is truly thought-provoki I won a copy of this essay collection via Goodreads Giveaway. I haven’t finished it. I think I can offer a review despite that admission. The essays are fascinating and so.well.written. Mr. Gottlieb’s mastery of the English language and the written word are immediately obvious. I think this collection is best digested in small pieces because each essay has such depth and is truly thought-provoking. His string of early successes was remarkable--and made to seem more remarkable by his constantly exaggerating his triumphs and disclaiming his failures. He had mastered the big things, like tax abatement, and the little things, like "creative floor numbering" to make tall buildings seem even taller. He had mastered, of course, the art of the deal, and he had mastered the art of getting away with it--surviving three FBI probes, for instance, and a press that turned violently against him, labeling him a vulgarian, a sorehead, a conniver, a racist, a liar. He was a supreme salesman because, as Blair makes clear, he was selling himself--eventually "he would be his own marketing gimmick, charging premium prices for condos and rentals in buildings bearing his name." Where Friedrich provided services and Fred built things, Donald projected image.